Aritra Singha ● Kolkata: Rising inflation has hit the artisans of Kumartuli hard this year with most idol-makers complaining about not being able to make ends meet. Prices of raw materials have hit the sky and even the once cheaper varieties have become unaffordable now. The cost of ingredients have also gone up nearly 50-60 percent, mainly in terms of labour charges and accessories. Veteran Kumartuli artisan, Tarun Pal, said: "This year we have been facing tremendous pressure on all fronts. Many of my brethren won’t be able to break even, leave alone earn profits.” He rued that while orders for supplying idols have not grown, there is also pressure from puja committees to sell cheap. Labour charges have risen from ₹300-400 last year to ₹800 this year on an average. The payout for skilled artisans often exceeds ₹1,200 per day. The dearth of talented craftsmen has also resulted in surging daily wages. “As far as raw materials are concerned, clay prices have gone up and so has the cost of raw bamboo, from ₹140 to ₹180 per piece,” claimed Bhaskar Mridha, another Kumartuli potter. The smaller idols, this year, will cost a minimum of ₹30,000, while the bigger ones will sell between ₹2-4 lakhs. For theme-based mega-pujas, the artisans work closely with the puja consultant and the budget for the idols alone can be upward of ₹10 lakh. As such, the idol making business at Kumartuli, is estimated to be worth anywhere in the ₹200-300 crore range. This year over 10,000 sets of goddess Durga and her children—Ganesh, Kartikeya, Lakshmi and Saraswati—are being made in bulk to suffice the demand from the 13,400 pujas in Kolkata and its suburbs. "We also send idols to all parts of India and abroad," Pal said. While most idols are made of clay, those sent abroad are often manufactured from fibreglass and other similar materials. “Making of these idols are even more costlier,” said Pal. Besides, more than 65 percent of idols will have lead-free paints this year, with the authorities pressing the artisans to go the eco-friendly way. “This has also raised the price of the idols because lead-free paints are very expensive,” said Nitish Saha, president of Forum for Durgotsav, an apex body of the city's puja organisers. Berger Paints and Asian Paints have been working with the idol makers and artisans of Kumartuli and Forum for Durgotsav to promote the use of lead-free paints, an initiative taken by Kolkata Municipal Corporation in 2010 to avoid the pollution of the Ganga. Only two pujas took the first initiative to use lead-free paints. "With corporate sponsorships down by nearly 30 percent, lavish puja budgets are being slashed this year. This has had an impact on Kumartuli as well," says Saha. 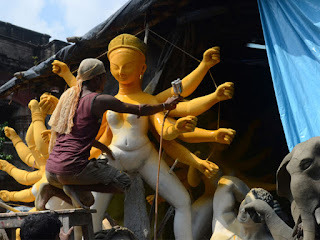 Kumartuli, largely centered around north Kolkata’s Banamali Naskar Lane, is the home to some 2,000-3,000 artisans, who get extremely busy this time of the year to keep the 250-year old idol making tradition alive. A tradition that has passed on through generations from the grandfather to the son and even the grandson.